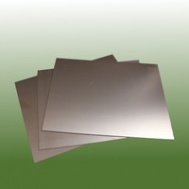 0.8 mm 1/2 oz double sided FR4 12" x 9"
9" x 12" 1oz copper clad is typically used in the manufacture of double sided PCB's with Plated Through Holes or Via's. The 1/2 refers to the thickness of the copper foil cladding. Typically 1/2oz board is processed and plated upto 1oz during the manufacture process. In low current digital applications either 1/2oz or 1oz can be used, for high current or very low resistance applications 1oz is often specified. FR-4 has excellent mechanical performance and good performance in dimension thickness.Copper cladded FR4 board material has an epoxy substrate with glass fiber enforcement, which is compliant with electroplating.